The bib-front gown is a very popular choice for Regency costumers because it fastens in the front, making it much easier to dress yourself. 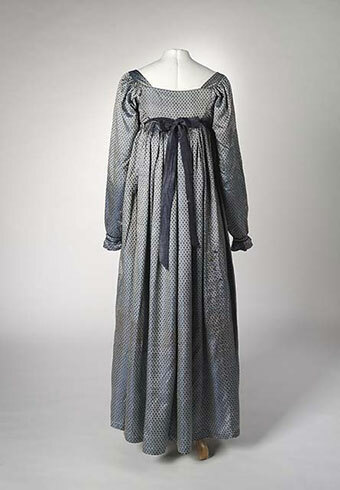 Once I started researching and patterning for Regency Women's Dress, I became convinced that the bib-front was something of an anachronism for most of the period - but then I took a closer look at the extant examples, and I realized that there are two distinct types of bib-front gowns. One type, certainly the most common of the two, is undeniably early in the period. The ones on p.42-45 (dress 1) and p. 46-49 (dress 2) of Regency Women's Dress are excellent examples, as is the famous one on p. 48-49 (dress 3) of Patterns of Fashion I. These three share some characteristics that pin them to the early years, roughly contemporary with the gowns that fasten on drawstrings in the front. For example, they all have very narrow, trapezoidal center back pieces, with the rest of the bodice functioning as front and sides, just as in 18th century dress construction. Dresses 2 and 3 both have short over sleeves, with the cotton cut on the bias and the lining on grain, and detachable undersleeves. Dresses 1 and 3 have sizable trains, while 2 and 3 are both cut without any flare in the skirt. 1 and 3 also have the bibs cut on the bias. All are made of printed cotton, 1 and 2 in a dense, early period print, and all have the skirt gathering concentrated in the center back. Here's another, from the Royal Ontario Museum, and here's one more at the Victoria & Albert Museum. But then there's another style of bib-front gown, sometimes varied with a crossover neckline. It's not really as common as the early-period version, when it comes to extants, but is more frequently recreated. How does it differ from the others? For one thing, the back - it's much wider, the side back seams sometimes coming almost to the sides. The waistline is also sometimes ever-so-slightly lower , and the skirt, instead of being gathered at the center back, is more loosely gathered or regularly knife-pleated all the way across from side to side. Here's one example of the crossover variety, originally listed on Vintage Textiles. Here is another, more traditional one, also originally from Vintage Textiles. Another in the National Museum of Australia. 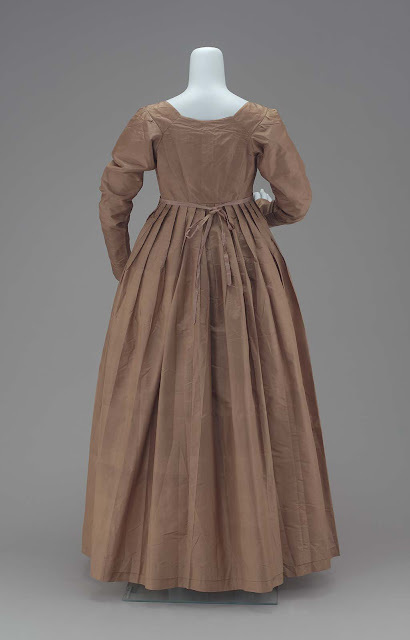 The movement of the side-back seams is in line with changes in fashion around the beginning of the literal Regency (though generally more exaggerated), and gathering across the entire back is also seen at that time, which gives us a rationale for dating these gowns later than the first category. However, the slightly lowered waist - at the level of the bottom of the modern bra - is more of a holdover from earlier years, and knife pleats all across the back are rare outside of this category. These unfashionable aspects remind me to an extent of several gowns with apron-front skirts (the bodices closing edge to edge in front) and known Quaker provenance. Here is one from the Missouri Historical Association; this is another at the Boston Museum of Fine Arts, and there is a third (are you surprised?) in Regency Women's Dress on p.66-69. These all have raised-but-not-high waistlines, front closures, and very even knife pleats across the back. They also have long sleeves, which is another key point that all or most of the second type of bib-front seem to have in common. I wish that more of them had provenance, because I suspect that there's something that ties together these gowns, all of which are fairly plain and not highly fashionable. Is there a regional relationship? Class-based? Social group? Or is it all just coincidence, and this is simply the last gasp of a style that had left mainstream fashion, made with some attempt to follow it? 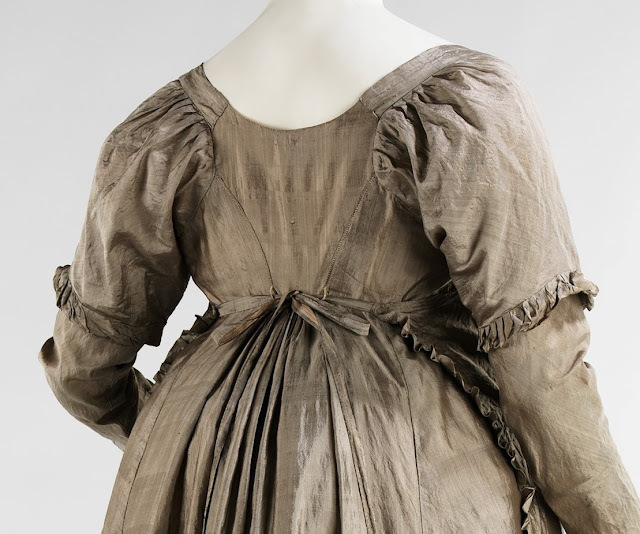 There are a few extant bibfronts, of the first type you mention, in the Swedish books "Kvinnligt mode" and it's basically the same construction from late 18th century to around 1815, only the waist moved up and the sleeves change. But I don't Think there are any of the otehr type. Thank you, that's helpful! While I was getting examples in order, I noticed that Scandinavia seems to be the only other place bib-fronts seem to come from - I wonder if that's part of the story? I'm not sure. It was forbidden for Swedes to emigrate during that period, so in general, we had very little contact with USA. Hm. What about the UK? Nearly all the extant bib-fronts I've come across have English provenance. My impression is that much fewer Swedish households had personal servants compared to England or France, so maybe Swedish women preferred bib-fronts because they often had to dress themselves? Bib gowns are so practical. The dress-yourself aspect seems like just the kind of unpretentious feature the Quakers would love. Design-wise, I've always loved the taupe/grey one from the Met; it's so unique. And the one from the National Museum of Australia is quite striking. I know, working on this post made me really want to make one! Thank you,this is highly interesting!